Alemu Tebeje Ayele is an Ethiopian exile journalist, teacher, poet, community activist and website campaigner based in London. He studied Ethiopian Languages and Literature, and Journalism at the universities of Addis Ababa and Wales respectively. He was also awarded a Diploma in Education and Training at the University of Westminster. His poems have been published in two anthologies ‘’Forever Spoken’’ and ‘’No Serenity Here’’, and other online and print literary magazines including Modern Poetry In Translation and The Missing Slate. 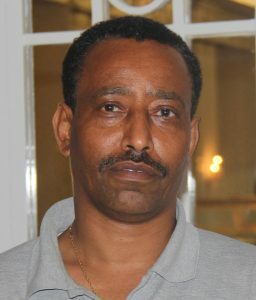 He co-admins a website, www.debteraw.com, named after one of the Ethiopian literary giants, Tsegaye Gebre Medhin Lucha (a.k.a. Debteraw). Debteraw was a founding member of the EPRP, former leader of the Ethiopian Student Movement, poet and Amharic language expert. Debteraw fell into the hands of the current regime in June 1991 and was killed later on. Greetings to the people of Europe! let him slap your left cheek too! let him have your trousers too! pluck us from the water like oily birds! all the lovely words your fathers preached to ours. እጄ ጠባብህን ደግሞ አትከልክለው . . .
ከሞት የተረፍን . . . ይዘው እያወጡ ዘይት እንደገቡ ብርቅ ወፎቻችሁ!